Meghan, Duchess of Sussex during a visit to the Association of Commonwealth Universities at University Of London on January 31, 2019 in London, England. In her new role as Patron of the international organisation which is dedicated to building a better world through higher education, the Duchess met students from the Commonwealth now studying in the UK, for whom access to university has transformed their lives. Meghan Markle finished off her look with a pair of Dean Davidson Signature Midi Knockout stud earrings. 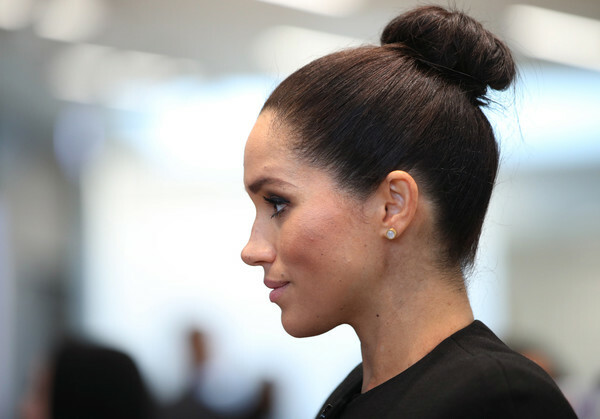 Meghan Markle traded in her signature messy updo for this neat high bun when she visited the Association of Commonwealth Universities.